Even in the fast-moving, ever-changing Formula One world, it is hard to believe that the Malaysian Grand Prix took place only four weeks ago. Perhaps only bad luck is to blame for hiding the signs of what was to come two races later, but even so, the Sepang race and the one which took place last Sunday at Imola, seem to be ages apart. Ferrari and Michael Schumacher looked set to endure a record-breaking season after easily winning the first two races of the year, while their McLaren rivals seemed to be struggling for performance and reliability, and Williams still looked as if they needed another year before challenging the top two. But in the space of a couple weeks, the Grove-based team were fighting for pole position and, later, for the win at the Brazilian Grand Prix. If any sceptic thought that was a fluke, Ralf Schumacher's performance last Sunday must have left them nearly breathless. Ralf had only finished one race so far this season, at Sepang, and even there, he had been forced into a spin at the first corner. In the other two events, he had been the innocent victim of other drivers. But at Imola, the young German clearly earned the right to become a Grand Prix winner, and not the brother of, by taking a dominant win after a flawless drive. If only bad luck has stopped him from such a result in the first three races of the season, he has the whole year ahead to prove it. After the Brazilian Grand Prix, where Juan Pablo Montoya was forced out of the race when he was leading, it was clear that Williams were back on top, but probably not even the "low-key approach" kings, as well as their partners BMW and Michelin, expected to be such a dominant force in San Marino. Ralf probably won the race at the start, but the way he then dominated the proceedings demonstrated that, with a bit of luck, he could challenge for the title this year, especially if both chassis, engine and tyres continue to develop at this rate during the rest of the season. A fully-deserved win, with no gifts from any of their rivals, showed Williams have the driver they need to return to the top. The start of the European season also seemed to have a magic effect on the performance of the McLaren team, at least compared to their Ferrari nemesis. After spending most of the practice sessions languishing far from the top, the Mercedes-powered cars occupied an unexpected front row, courtesy, perhaps, of their soft rubber tyre choice in contrast to the harder compound chosen by Ferrari. However, the Woking-based team maintained the upper hand over the Italian rivals during the race too and, especially David Coulthard, proved that the softer compound was clearly the way to go. The Scot continued with the trend of the first three races - not setting the pace, but staying out of trouble, and scoring some valuable points. 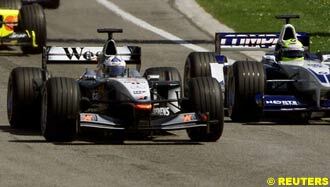 The Spanish Grand Prix was the inflection point for Mika Hakkinen last season, and McLaren will probably wait until the next race before putting all their hopes in Coulthard this year, but things look less promising for the Finn that they did in 2000. 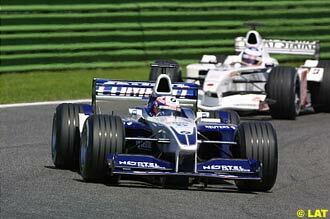 Last year, Hakkinen at least had the speed before he began to win races and challenge for the title. In 2001, however, the prospects don't look so good, and after being outperformed by Coulthard during the races he now lies 22 points behind him. For Ferrari and Michael Schumacher the only good news after San Marino is that they still lead both championships despite one of the most disappointing performances of the Italian team in the last year. Not only did they discover a new rival in Williams, but they also were outpaced, outsmarted and, what's worse, experienced reliability problems on Schumacher's car. Ron Dennis and his McLaren team have promised the European season would see their return to form, and qualifying for the San Marino Grand Prix proved them right, though the right tyre choice played a big part in the final order of the grid. The Mercedes-powered MP4-16s delivered a blow to their Ferrari rivals at their home Grand Prix by grabbing the first two spots on the grid in the dying moments of a cold session following the morning rains which hampered the team's progress during the free practice sessions. Michael Schumacher had set the pace both in Friday and Saturday practice, anticipating what seemed set to be a record-equalling eighth pole position in a row, and for most of the qualifying hour the German was on top despite having chosen the hard Bridgestone compound. David Coulthard and Mika Hakkinen opted for the softer compound which, unlike the harder rubber, needed only one lap to heat up and so both drivers had four three-lap stints, in contrast with Ferrari's three four-lap attempts. With a slightly damp track and some threatening clouds above, everyone jumped onto the track as soon as the pitlane opened. 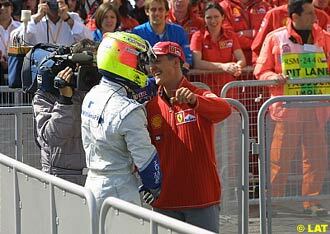 Schumacher was the first of the top drivers to complete a lap, only to be demoted by his brother Ralf seconds later. After a frantic couple of initial minutes, Rubens Barrichello ended on top, after edging Mika Hakkinen and Heinz-Harald Frentzen. Coulthard, who had damaged his car on Friday after running off the track, was the last driver to leave the pits and with the track conditions improving by the second, the Scot set the fastest time of 1:25.014. He wouldn't stay there for long, for three minutes later, Hakkinen returned to the track for his second attempt and lapped nearly eight tenths quicker. Schumacher changed his car's rear wing settings - adding more downforce - and was back on track only fifteen minutes into the session. His Ferrari worked better this time and he retook the first spot, lapping within the 1:23s for the first time. On his second flying lap, the German improved once more to 1:23.674, more than a second quicker than last's year pole time. Schumacher's time seemed unreachable for the rest of the drivers, who for a while had to settle with the fight for the second row. Juan Pablo Montoya and teammate Ralf Schumacher presented their credentials by setting the third fastest time consecutively. Meanwhile, 20 minutes into the session, Hakkinen was second and Coulthard a distant sixth. While things were quiet for the next 20 minutes or so, Coulthard took the chance to complete his second run, which was good enough to move him up to third spot, only to be demoted by Frentzen a few minutes later, the Jordans clearly holding the upper hand over their Honda rivals at BAR. Jarno Trulli would move up to fourth for a moment, only to be pipped by the Williams drivers. On his third run, with more than 40 minutes of the session gone, Coulthard jumped up to second, with Ralf third, Hakkinen fourth, Montoya fifth and Trulli rounding up the top six. Barrichello, meanwhile, was lying in eleventh place with only eight minutes remaining, but the Brazilian climbed up to third on the first lap of his final run. He then spoiled his second flying lap and had to spend the final minutes of the session watching his rivals on track. Hakkinen was the first one to spoil Ferrari's party on his third attempt, and with a 1:23.381 he leaped up to the top spot, relegating Schumacher to second place. 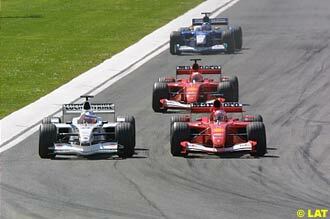 Minutes later, Coulthard, Schumacher and Hakkinen jumped again onto the track for their final assault. Schumacher was the first one to come out in order to complete his final two-lap run, but the German tried too hard and suffered a big lock-up, ruining the first attempt seconds before Coulthard set an impressive 1:23.054 to steal pole from Hakkinen, who was still to complete his final lap. The checkered flag had fallen when Schumacher crossed the line for the last time, improving to 1:23.593, way behind Coulthard's time. However, the worst was yet to come for the current World Champion, as Hakkinen first, and Ralf later, would improve their times, relegating him to fourth place. Schumacher was far from happy with his performance, but at least he found consolation in the fact that Ferrari had opted for the right tyres. Or that's what he thought anyway. "I think I am happier starting on the second row of the grid on the right tyres for tomorrow, than to be on pole with the wrong ones," said Schumacher. "It was clear that the right moment to go for a time was at the end, but I did not make the most of it. I lost four tenths in the last sector on my last lap. It was my fault." Coulthard, who on his way to pole position beat the current track record, was delighted after denying Schumacher his eighth consecutive start from the top spot. "It is not personal," Coulthard said, laughing. "I feel fantastic to be on pole and have a big advantage for the start. I am sorry for the Italians and supporters of Ferrari - and I think we will try not to do it again. I am a little surprised (about the car's performance) but I expected to see an improvement on this track. The team changed the car last night and worked until four o'clock this morning." Hakkinen completed the first all-McLaren front row since Canada 2000 and, as usual, the Finn was very diplomatic afterwards: "Many occasions I have been in front and this time it is nice to let him be there. It is very simple. We are team-mates and it is nice for David to have the pole." Ralf Schumacher was third, in front of his brother for the third time in his career - he had outqualified Michael in Italy 1997 and Germany 1998. The young German, though, was not concerned about the triple world champion. "I am not worried about Michael," admitted Ralf. "I am always called the smaller one but actually I am bigger and heavier. I don't think he will come too near me or anything in the race..." Indeed, he would not. Despite a cool warm-up, the skies cleared up on race day and the worries about a possible wet race disappeared. Unlike the first three Grands Prix, this time there were no pre-race incidents or rushes to take the spare car, and the start was very clean. Ralf made a perfect start while Coulthard and Hakkinen had too much wheelspin and saw the young German fly past both of them. Coulthard tried to close the gap on his left side, but Ralf was a man on mission and - unlike last year - he did not lift the throttle, and when they had to brake at Tamburello, the Williams was clearly in front of the two McLarens. "Yes, it was the same situation (as last year) but this year I was in third and luckily David gave me the space," related Ralf. "I think it was a clean start apart from that." 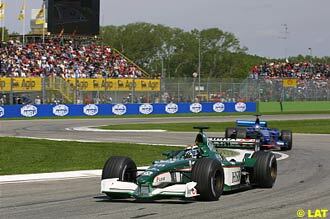 Trulli, starting from fifth, also made a great start and overtook Hakkinen under braking at the first chicane. After a brilliant performance in qualifying, McLaren's race was spoiled even before the first lap was completed, as it soon became apparent that Coulthard could not match Ralf's initial pace, and Hakkinen was stuck behind Trulli. Further back, Schumacher had lost one place and Barrichello, continuing with the trend of bad starts this year, was down in eighth, right behind Olivier Panis, whose start was under investigation for some time. However, the Frenchman escaped any penalties. Panis would quickly be passed by a charging Montoya, who once more demonstrated his ability on cold tyres. While Ralf began to edge away from Coulthard, his brother Michael was not so lucky and, on lap four, he lost two places after a problem with his car's gear change system slowed him down at the exit of the final chicane. The German fell down to eighth spot, but he was able to resume the race with no apparent problems. On lap five, Ralf's gap over Coulthard was more than 2.5 seconds, while Trulli was nearly ten seconds behind and Hakkinen was unable to do anything about it. Despite a much quicker car, the Finn was never close enough to try something, and continued losing ground to the leading duo. 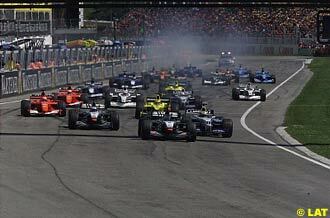 "The start basically decided the outcome of my race, when I was passed by Trulli," said Hakkinen. "It's very difficult to overtake at Imola unless the driver in front of you makes a significant mistake, so I was stuck in fourth place for most of the race." There were no order changes for some laps, until Barrichello dived on the inside of Panis at Rivazza, who was struggling with oversteer and was incapable of putting up a fight for his place. A lap later, the BAR driver lost another place to Schumacher, who was being put under pressure by an impressive Kimi Raikkonen at the wheel of the Sauber. Only ten laps were necessary to figure out that unless a mechanical failure struck both of them, the race would belong to either Ralf or Coulthard, as Hakkinen, still stuck behind Trulli, was more than 15 seconds behind and on the same two-stop strategy. By lap 16, the gap was more than 20 seconds. Raikkonen, whose temporary four-race superlicense expired in San Marino, retired on lap 17 after a brilliant race, where he showed his maturity by putting veteran Panis under immense pressure during their fight for eighth. There is little doubt that, in only four Grands Prix, the 21-year old Finn earned his right to have a permanent license. Up in front, Ralf extended his lead over Coulthard to some four seconds, while on lap 23, Michael's weekend to forget continued as he suffered a puncture on his left front tyre. To make matters worse, it happened a long way from the pits, and the German was forced to cruise around Imola. Schumacher rejoined the race in 17th place, but he would only complete one more lap before his team called him in as there was a more serious problem with his car. "It wasn't a great weekend," Schumacher said after retiring from a race for the first time since July last year at the German Grand Prix. "There was something wrong but I don't know what and the team told me to stop, which I was quite happy to do. We had a lot of brake damage as well and it was very disappointing." Hakkinen's nightmare ended on lap 24, when Trulli finally came in to make his first scheduled stop, allowing the Finn to run in clean air for the first time. Not that it mattered anyway, as the McLaren driver was more than 25 seconds behind the leaders. While Montoya completed his first Formula One pitstop on lap 27, Coulthard was the first of the leaders to come in, on lap 28, when he was nearly six seconds behind Ralf. The German pitted a lap later - as well as Hakkinen - and despite a similar-length stop, his advantage over Coulthard was more than eight seconds two laps later. 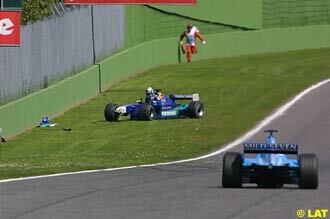 Montoya, meanwhile, demonstrated his amazing skill again, overtaking Trulli on the outside of Tamburello. It was a further prove that it is possible to overtake in Formula One, and that there's no need to crash if both drivers behave properly. 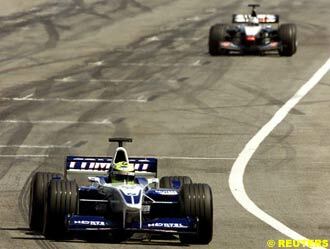 Barrichello, on hard tyres, pitted halfway through the race, and the Brazilian took advantage of a couple of fast laps to rejoin the race in third place, in front of Hakkinen and Trulli. There was hardly any action during the next fifteen laps or so, and Ralf continued to increase his gap over Coulthard - 12 seconds on lap 34. Trulli started the second round of stops on lap 43, when he was running sixth. Coulthard followed suit on lap 46, while Ralf did it a lap later. The order remained unchanged except for Montoya who, on his second stop, stalled his car due to a clutch problem, losing more than a minute. The Colombian rejoined the race, but retired a lap later. "Again I could not finish the race and again I am disappointed," admitted Montoya "When I stopped for my second pit-stop I had a problem with the clutch and I could not get anymore gears. I went out of the pits but I was stuck in first gear and all I could do was drive back into the garage. We've been quite unlucky so far but these things happen." After their respective stops, Barrichello continued third in front of Hakkinen, while Trulli was fifth and his teammate Frentzen was sixth. With a flawless drive, Ralf maintained his 10-second gap over Coulthard, who was only able to get closer to the Williams on the final stages of the race, when the German was shown the "Oil Pump" sign seven laps from the end. But there were no problems and, after 70 Grands Prix, Ralf finally crossed the line in first place, not only scoring his first ever win, but also giving BMW and Michelin their first win since 1986 and 1984 respectively. He also ended the Williams drought, which lasted nearly four years. "It is a great experience and I hope it is the first of many," said Ralf. "I've waited long enough for it and we've done a lot of work with Williams and it paid off today. "It was perfect and may be the beginning of something." Coulthard had to settle for second, unable to match the Williams' pace during the entire race. As he had done in the previous three races, the Scot completed an almost anonymous race to score some valuable points which allowed him to tie for the lead of the title race. Barrichello was a very distant third, which was a small consolation for the thousands of tifosi who filled Imola hoping to see a red car winning for the third year in a row. Hakkinen was fourth, in front of the two Jordans of Trulli and Frentzen, winning another round of the Honda users battle over BAR. But the day belonged to Ralf Schumacher and the Williams team who, as always maintaining their low-key approach, were quick to dismiss their championship options this year. With traction control coming into play at the next Grand Prix in Spain, no one knows what to expect, or who's the favourite. Things are moving very fast in Formula One. Don't blink, or you might miss it all. Lap 1: At the start David Coulthard has too much wheelspin and Ralf Schumacher is able to move to the inside as they go down to the first corner and he gets ahead before the braking area for the Tamburello chicane. Jarno Trulli outbrakes Mika Hakkinen to be third into the corner with Michael Schumacher fourth ahead of Olivier Panis, Juan Pablo Montoya and Rubens Barrichello. In the course of the first lap Montoya outbrakes Panis to grab sixth place. Giancarlo Fisichella has a very good lap to move from 19th on the grid to 15th at the end of the lap. Lap 2: Ralf Schumacher builds up a lead of over a second over Coulthard and the two leaders pull away from Trulli, who is holding up Hakkinen. In the midfield Nick Heidfeld overtakes Eddie Irvine to take 12th position and at the back of the field Jos Verstappen overtakes Luciano Burti for 16th. Lap 3: Schumacher R increases his lead to 2.2 seconds while behind him Montoya overtakes Schumacher M for fifth when the Ferrari driver runs slightly wide at the last corner. Lap 4: As Hakkinen pressures Trulli for third place, Schumacher M falls to eighth place behind both Olivier Panis and Rubens Barrichello. Lap 5: The order at the front remains unchanged but in the midfield Verstappen overtakes Fisichella for 15th place. At the back of the field Tarso Marques drops behind Gaston Mazzacane. Lap 6: Fernando Alonso runs over a kerb at the Variante Alta and goes off, crashing into a tyre barrier as he runs wide. Lap 7: Jos Verstappen pulls off with a mechanical problem. Lap 8: Barrichello overtakes Panis to take sixth place. Lap 9: Schumacher M takes seventh position from Panis. Lap 10: The two leaders continue their battle with the gap around two seconds, both men setting fastest laps. 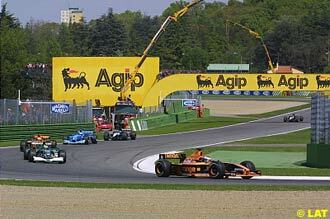 Hakkinen continues to pressure Trulli for third place. Lap 14: Montoya comes under pressure from the two Ferraris but all three are closing up on the battle for third. Behind them Panis holds off Kimi Raikkonen in the battle for eighth place. Lap 18: Ralf Schumacher finally begins to pull away from Coulthard, increasing his gap to 3.3 seconds. Raikkonen spins out of ninth place and hits a wall. Lap 19: Seventeenth-placed Jenson Button pits for fuel and new tyres but leaves without fuel. Lap 20: Button pits again so that the car can be refuelled. 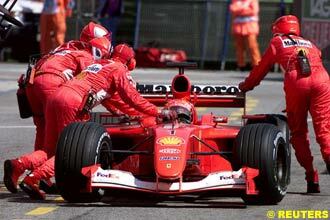 Lap 21: Thirteenth-placed Jean Alesi pits, followed into pitlane by Fisichella, Burti and Marques. Lap 22: Panis drops from eighth to 12th. Lap 23: Michael Schumacher has a front left puncture and had to do a slow lap. He pits and rejoins in the middle of the field. Lap 24: Trulli pits, allowing Hakkinen to move to third place. Jarno rejoins in eighth. At the back of the filed Michael Schumacher retires from the race after one exploratory lap. Lap 25: Ninth-placed Heidfeld pits. Mazzacane also stops. Lap 26: Frentzen pits from seventh place. Lap 27: Ralf Schumacher's lead goes out to 5.7 seconds. Coulthard is a lonely second with Hakkinen a distant third. 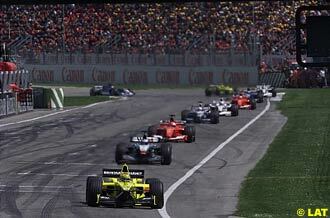 Barrichello is fourth after Montoya stops. Also stopping is Panis. Lap 28: Coulthard pits but remains in second place. 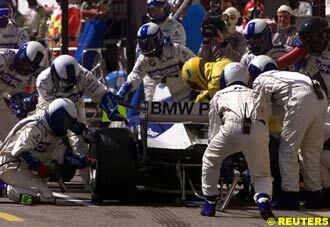 Lap 29: Ralf Schumacher, Hakkinen and Villeneuve all pit. Hakkinen emerges ahead of Trulli. Mazzacane retires with a blown engine. Lap 31: Villeneuve goes out with a blown engine. Eddie Irvine, who has risen to seventh as others have pitted, stops and drops to 10th. Fisichella retires with a mechanical problem. Lap 32: Barrichello stops and is able to rejoin still in third place. Burti is the last runner to stop. Lap 43: After a period of stability, the gaps at the front are not much changed. Sixth-placed Trulli is the first man to stop for a second time. At the tail of the field Irvine retires with a mechanical problem. Lap 44: Frentzen pits., dropping behind Trulli again. Lap 45: Coulthard stops but once again remains in second place. Also pitting is Nick Heidfeld is eighth-placed Heidfeld. Lap 46: Schumacher stops for the second time but he remains in the lead. 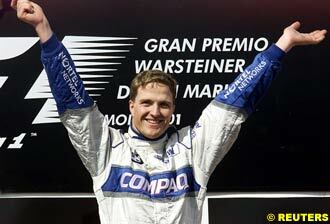 Hakkinen also stops but he too retains fourth position. Lap 47: Barrichello and Montoya both pit from third and fourth places. Rubens rejoins in thirrd but Montoya has a problem with the electrics and loses around 50 seconds. He rejoins but retires a lap later. Lap 48: The order at the start is set. Ralf Schumacher leads Coulthard by 10 seconds. There is then a gap of half a minute back to Barrichello who has Hakkinen closing up on him. Trulli is fifth, the last man not to be lapped and the top six is completed by Frentzen. Heidfeld is seventh with Panis eighth and Alesi ninth. Lap 62: Ralf Schumacher wins his first Grand Prix, giving BMW and Michelin their first wins in the modern era and Williams its first victory since the Luxembourg Grand Prix of 1997.